An innumerable amount of ancient mysteries has intrigued the human race throughout history. In fact, history – in and of itself – is a highly engaging and enticing subject that takes us to the mystifying, perplexing, and highly mysterious world of the past. Archeologists, historians, scientists, philosophers, theologists, theorists, medical professionals, and other types of professionals are consistently looking to our past in order to create, design, and stabilize our future. In doing so, many unsolved mysteries, bizarre mysteries, and baffling mysteries have been uncovered. Here at Greatest Unsolved Mysteries, we seek to share the information that has been discovered in hopes that we may play a role in unraveling the past in order to positively contribute to the future. In evaluating the people, situations, and events that have transpired in the past, we can clearly see that our ancestors possessed a vast array of knowledge, wisdom, and keen insight. This is so evident that the great minds of our world today find it puzzling and highly perplexing. Those that came before us have left many clues for us to analyze and interpret. In doing so, we not only gain a deeper level of insight into the world of the past, but we have come to the understanding that solving these ancient mysteries may predetermine our future, and the future of those that come after us. In order to understand the ancient wisdom of our ancestors and the progression of our world, we must keep the stories and details of the ancient mysteries alive – not only for ourselves, but for future generations. Many bizarre mysteries and unsolved mysteries make up ancient mysteries that directly relate to the way in which our world has progressed. 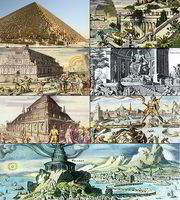 Examples of such stories include that of the Hanging Gardens of Babylon, the Great Pyramid of Giza, the Lighthouse of Alexandria, as well as the Colossus of Rhodes. Then, there are stories and ancient mysteries that seem to outline our future. Here at Greatest Unsolved Mysteries, you will learn about both types of ancient mysteries – those that have led to the progression of the world, and those that seem to possess details regarding the future of the world. Recently, an estimation revealed that the world includes approximately 7.6 billion people. Technological advancements and advancements in travel have allowed us to come up with this estimation; however, it is difficult to determine how many people have existed on this planet before us, with any level of accuracy. One thing is certain, though, those that existed in the past have left us with many stories, artifacts, clues, and information about the past. It is obvious, though, that even more stories have been left untold, we have yet to discover all of the objects that have been buried and hidden in other ways, and just how many mysteries are still left unsolved. To date, we do know a great deal about the ancients and the world when they existed on it; however, there is so much more. We will probably never discover or even comprehend the world and those people, events, and situations that existed in the highly-distant past. For all of the scrolls, the unique symbols, the artifacts, the evidence of entire civilizations, and the technology that we have uncovered from the past, there is still much left to be found, to be discovered, and to be interpreted. Here at Greatest Unsolved Mysteries, we aim to provide you with the ancient mysteries, the bizarre mysteries, and the best unsolved mysteries of the past to provide you with insight into where our world was, how far it has come, and what we may expect in the future. If you would like to keep up with what's new at Greatest Unsolved Mysteries and receive a free ghost hunting guide,then be sure to sign up for our newsletter! I promise to use it only to send you Mysteries Monthly. If you have an interest in ancient mysteries, information on these mysteries, or just wish to share your thoughts on these mysteries, we encourage you to share it with us. Your knowledge, your experiences, and your thoughts on these intriguing mysteries may help to provide our generation and future generations with the ability to uncover the wisdom of the past so that we may create a more detailed, stable, and productive future. Simply share here. The Antikythera Mechanism is considered to be one of the most intriguing ancient mysteries of all time. For thousands of years, this has been considered to be one of the most mythical cities in the world. While many people wonder if the continent really did exist, others wonder what Atlantis looked like. Interest in the Aztec sun stone has increased as the year of 2012 draws near. Its incredible height made it among the tallest statues in ancient history. One of the world's greatest mysteries surrounds the famous statutes that are located on this island. Known as one of the original 7 Wonders of the Ancient World, the Hanging Gardens of Babylon were truly magnificent. The one question that has baffled hundreds, even thousands for close to a century is, "Does the curse of King Tut really exist?" For as long as historical buildings have been evaluated, the Lighthouse of Alexandria is considered to have been one of the top three tallest structures in the world. This form of voodoo still remains to be one of the most mysterious associated with any particular religion. The ancient City of Petra has recently been voted as one of the “New Seven Wonders of the World”. The significance of this ancient world map lies in three areas. The Temple of Artemis is one of the greatest unsolved mysteries of our modern world. Would You Like to Share Information on Your Favorite Ancient Mystery? In order for us, and those that come after us, to continue seeking answers to the unsolved mysteries of the past, we must keep them alive. We must continue to share the stories with those around us, and urge those individuals to continue sharing those stories. Please feel free to write about your favorite ancient mysteries. You may also add any information you have learned about these mysteries, or your opinions on the ancient mysteries of the world. Civilization may be 65 - 100 Million Years Old!